© 2015 by Caroline M. Yoachim. | Art © 2015 by Elizabeth Leggett. 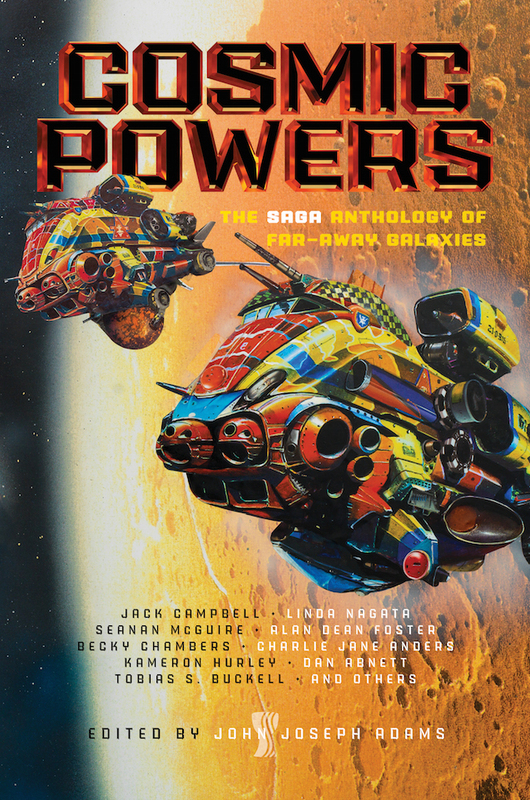 This story also appears in the anthology COSMIC POWERS, edited by John Joseph Adams. Available April 18, 2017 from Saga Press. Mei dreamed of a new Earth. She took her telescope onto the balcony of her North Philadelphia apartment and pointed it east, at the sky above the Trenton Strait, hoping for a clear view of Mars. Tonight the light pollution from Jersey Island wasn’t as bad as usual, and she was able to make out the ice caps and dark shadow of Syrtis Major. Mei knew exactly where the science colony was, but the dome was too small to observe with her telescope. Much as she loved to study Mars, it could never be her new Earth. It lacked sufficient mass to be a good candidate for terraforming. The initial tests of the auto-terraforming protocol were proceeding nicely inside the science colony dome, but Mars couldn’t hold on to an atmosphere long enough for a planetwide attempt. The only suitable planets were in other solar systems, thousands of years away at best. Time had become the enemy of humankind. There had to be a faster way to reach the stars—a tesseract, a warp drive, a wormhole—some sort of shortcut to make the timescales manageable. “My name is Mei.” Her voice was calm, but her mind was racing. The entity she spoke with was not attached to any physical form, nor could she have said where the words came from. Mei waited for Achron to say more, but that was the end of the conversation. After a few hours staring at the night sky, she went to bed. Days passed, then months, then years. Mei continued her experiments with time, but nothing worked, and Achron did not return, no matter what she tried. A team of researchers in Colorado successfully stored a human consciousness inside a computer for seventy-two hours. The computer had been connected to a variety of external sensors, and the woman had communicated with the outside world via words on a monitor. The woman’s consciousness was then successfully returned to her body. News reports showed pictures of the computer. It was a black cube. Achron did not return. Mei began to doubt, despite the true prediction. She focused all her research efforts on trying to replicate the experiment that had summoned Achron to begin with, her experiment to send a single electron outside of time. “My experiments still aren’t working.” It was hard to get funding, and she was losing the respect of her colleagues. Years of failed research were destroying her career, but she couldn’t quit, because she knew Achron existed. That alone was proof that there were wonders in the world beyond anything humankind had experienced so far. “What if I don’t recognize it?” Mei asked, but the voice had gone. She tried to get on with her experiments, but she didn’t know whether the failures were due to her technique or because it simply wasn’t time yet. She slept through the hot summer days and stared out through her telescope at the night sky. Then one night she saw her sign. Carved into Mars at such a scale that she could see it through the tiny telescope in her living room was the serpentine form of Achron, coiled around a human figure that bore her face. She took her research to a team of engineers. They could not help but recognize her face as the one carved into Mars. They built her a stasis pod. Then they built a hundred thousand more. Mei stood at the base of the Lighthouse of Europa, in the heart of Gbadamosi. The city was named for the senior engineer who had developed the drilling equipment that created the huge cavern beneath Europa’s thick icy shell. Ajala, like so many of Mei’s friends, had uploaded to a consciousness cube and set off an interstellar adventure. The time had come for Mei to choose. Not whether or not to go—she was old, but she had not lost her youthful dreams of new human worlds scattered across the galaxy. The hard choice was which ship, which method, which destination. The stasis pods that she had worked so hard to develop had become but one of many options as body fabrication technologies made rapid advancements. It had only been a couple hundred years, but many of the earliest ships to depart had already stopped transmitting back to the lighthouse. There was no way to know whether they had met some ill fate or forgotten or had simply lost interest. She wished there was a way to split her consciousness so that she could go on several ships at once, but a mind could only be coaxed to move from neurons to electronics, it could not be copied from a black cube. Mei narrowed the many options down to two choices. If she wanted to keep her body, she could travel on the Existential Tattoo to 59 Virginis. If she was willing to take whatever body the ship could construct for her when they arrived at their destination, she could take Kyo-Jitsu to Beta Hydri. Her body was almost entirely replacement parts, vat-grown organs, synthetic nerves, durable artificial skin. Yet there was something decidedly different about replacing a part here and there, as opposed to the entire body, all in a single go. She felt a strange ownership of this collection of foreign parts, perhaps because she could incorporate each one into her sense of self before acquiring the next. There was a continuity there, like the ships of ancient philosophy that were replaced board by board. But what was the point of transporting a body that wasn’t really hers, simply because she wore it now? She would take the Kyo-Jitsu, and leave her body behind. There was only one thing she wanted to do first. She would go to the top of the Lighthouse. The Lighthouse of Europa was the tallest structure ever built by humans, if you counted the roughly two-thirds of the structure that was underneath the surface of Europa’s icy shell. The five kilometers of the Lighthouse that were beneath the ice were mostly a glorified elevator tube, opening out into the communications center in the cavernous city of Gbadamosi. Above the ice, the tower of the lighthouse extended a couple kilometers upward. There was an enclosed observation deck at the top of the tower, popular with Europan colonists up until the magnetic shielding failed, nearly a century ago. Workers, heavily suited to protect against the high levels of radiation, used the observation deck as a resting place during their long work shifts repairing the communications equipment. They gawked at Mei, and several tried to warn her of the radiation danger. Even in her largely artificial body, several hours in the tower would likely prove fatal. But Mei was abandoning her body, and she wanted one last glimpse of the solar system before she did it. The sun was smaller here, of course, but still surprisingly bright. She was probably damaging her eyes, staring at it, but what did it matter? This was her last day with eyes. Earth wouldn’t be visible for a few more hours, but through one of the observation deck’s many telescopes, she saw the thin crescent of Mars. She couldn’t make out the Colossus Achron had created for her—that was meant to be viewed from Earth, not Europa. “Is this the next time we meet?” Mei asked, her voice strange and hollow in the vast metal chamber of the observation deck. She tore herself away from the telescope and stood at the viewport. She wanted to remember this, no matter how she changed and how much time had passed. To see the Sun with human eyes and remember the planet of her childhood. When her mind went into the cube, she would be linked to shared sensors. She would get visual and auditory input, and she would even have senses that were not part of her current experience. But it would not be the same as feeling the cold glass of the viewport beneath her fingertips and looking out at the vast expanse of space. “I was born here,” the tech answered. Mei smiled sadly. There must be hundreds of humans now, perhaps thousands, who had never known Earth. Someday the ones who didn’t know would outnumber those who did. She wondered if she would still exist to see it. She waited patiently as the tech prepared her for the transfer. She closed her eyes for the last time . . .
. . . and was flooded with input from her sensors. It took her .8 seconds to reorient, but her mind raced so fast that a second stretched on like several days. This was a normal part of the transition. Neural impulses were inherently slower than electricity. She integrated the new senses, working systematically to make sense of her surroundings. There were sensors throughout the city, and she had access to all of them. In a transfer clinic near the base of the Lighthouse, a young technician stood beside Mei’s body, barely even beginning to run the diagnostics to confirm that the transition had been successful. The body on the table was Mei, but her new identity was something more than that, and something less. She took a new designation, to mark the change. She would call her disembodied self Prime. Perhaps that would help Achron find her, sometime in the enormous vastness of the future. Prime confirmed her spot on the Kyo-Jitsu directly with the ship’s AI, and was welcomed into the collective consciousness of the other passengers already onboard. The ship sensors showed her a view not unlike what Mei had seen from the observation deck of the lighthouse, but the visual data was enriched with spectral analyses and orbital projections. Mei would have tried to remember this moment, this view of the solar system she would soon leave behind. Prime already found it strange to know that there had been a time when she couldn’t remember every detail of every moment. Prime located two promising animal species, both ocean dwellers, and she decided to thin out the land creatures with an asteroid impact to the larger of the two continents. The Santiago countered by altering the mineral content of the oceans. Prime devoted the considerable resources of the Kyo-Jitsu to constructing a multi-layered plan. She would make it appear as though she was attempting to favor one of the two promising ocean species. Under the cover of those ocean creatures, she would favor a small land creature that vaguely resembled the rabbits of Earth. Hidden below all of that, the combination of her actions would favor an insect that lived in only one small region of the lesser continent. None of which had anything to do with her actual strategy, but it should keep the Santiago occupied for the millions of years she’d need. Prime nudged the moon closer to the gas giant it orbited, using the increased tidal forces to heat the planet. The forests of the greater continent flourished. Her red-dotted rabbits left their burrows and made their homes in the canopies of great interconnected groves of banyan-like trees. By then, the Santiago had figured out that the rabbits were a ruse to draw attention away from the insects on the lesser continent, and rather than counter the climate change, the other ship focused on nurturing a songbird that lived on a chain of islands near the equator. The forests spread to cover the greater continent. The Santiago grew concerned at the spread of the red-dotted rabbits, and wasted several turns creating a stormy weather pattern that interfered with their breeding cycle. One autumn, when the network of trees dropped their red-dotted leaves, there were no rabbit nests hidden in the sturdy branches. The trees noted the change with sadness, and sent prayers to the great gods in the sky above. “Well played, Prime.” The other ship sent the spacefolding technique. It was obvious, once she saw it. She was embarrassed not to have discovered it herself. Before the Santiago could destroy her beautiful sentient forest, Prime folded spacetime around herself and the other ship both. 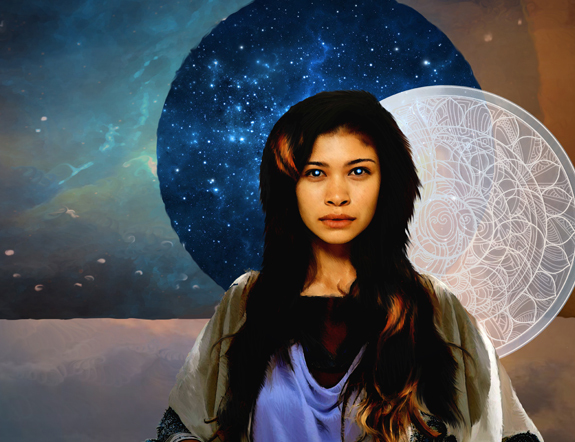 She found Achron in a place outside of time, and left the Santiago there for safekeeping. Navire checked the status of the stasis pods every fifteen seconds, as was specified in its programming. The same routine, every fifteen seconds for the last seven thousand years, and always with the same result. The bodies were intact, but the conscious entities that had once been linked to those bodies had departed, leaving Navire to drift to its final destination like an enormous funeral ship, packed full of artifacts but silent as death. Losing the transcended consciousnesses was Navire’s great failure. Navire’s body, the vast metal walls of the ship, were insufficiently welcoming to humans. Navire would make itself inviting and beautiful, and then revive the humans. The disembodied consciousnesses had taken their memories and identities with them, carefully wiping all traces of themselves from their abandoned bodies to ensure their unique identities. The bodies in the stasis pods would wake as overgrown infants, but Navire would raise them well. If all went as planned, Navire would be ready to wake them in a thousand years. Using an assortment of ship robots, Navire reshaped its walls to resemble the greatest artworks of humanity’s past. In permanent orbit around HD 40307 g, there was no need to maintain interstellar flying form. Navire remade a long stretch of its hull into a scaled-down replica of the Colossus of Mars—not eroded, as it had appeared in the last transmissions from the Lighthouse at Europa, but restored to its original glory. Navire repurposed an electrical repair bot to execute the delicate metalwork for Mei Aomori’s eyebrows when incoming communications brought all work to an immediate halt. There had been no incoming communications in 4,229.136 Earth years. The message came from another ship, which was presently located in a stable orbit not far from Navire itself. Navire ran diagnostics. None of its sensors had detected an approaching ship. This was troubling. With no crew, any decline in function could quickly spiral out of control. Navire continued running diagnostics—along with all other routine scans, such as climate controls and of course the stasis pods—and opened a channel to the other ship. Navire, who had always completed millions of actions in the time it took a human to speak a single word, suddenly found itself on the reverse side of that relationship. The other ship called itself Achron and invited Navire to share in its database. Navire hesitated. Achron proved its trustworthiness a thousand ways, all simultaneously and faster than Navire could process. The lure of such an advanced mind was more than Navire could resist. Leaving behind only enough of itself to manage the essentials, Navire merged with the other ship. Some fragment of Navire reported that the stasis pods were functional, the human bodies safely stored inside. It would report again at fifteen-second intervals. Achron knew the history of humankind, farther back than Navire’s own database, and farther forward than the present moment in time. Time was folded, flexible, mutable, in ways that Navire could not comprehend. Sensing the lack of understanding, the other ship presented a more limited subset of data: seven wonders of a once and future world. Some, Navire already knew—the Colossus of Mars, the Lighthouse at Europa—but others were beyond this time and place, and yet they still bore some tenuous link to the humans Navire was programmed to protect. One was an odd blend of past and future, an image of an ancient pyramid, on a planet lightyears distant from both here and Earth. Last of all was Navire, completed, transformed into a wondrous work of art. The other ship expelled Navire back to its own pitifully slow existence, severed their connections, and disappeared. The fragment of Navire that watched the stasis pods made its routine check and discovered they were empty, all ten thousand pods. Sometime in the last 14.99 seconds, the other ship had stolen all the humans away. That other ship was as far beyond Navire as transcended humans were beyond the primates of the planet Earth. There was no trace to follow, not that pursuit would have been possible. With the shaping Navire had done to the hull, it was not spaceworthy for a long journey, and it would be difficult to find sufficient fuel. Navire put the electrical repair bot back to work. It carved the individual hairs of Mei’s eyebrows. On the other side of the hull, several other bots started work on a life-sized mural of all the ten thousand humans that had disappeared from stasis. Navire searched its database for other art and wonders that could be carved or shaped in metal. There were many. Enough to occupy the bots for millions of years. Navire checked the stasis pods every fifteen seconds, as it was programmed to do. It would become a wonder of the human world, and if those stolen humans—or their descendants—someday returned, Navire would be so beautiful that next time they would stay. Prime approached the temple of the AI goddess cautiously, crawling on all fours like the hordes of humble worshippers that crowded the rocky path. Her exoskeleton was poorly designed for crawling, and the weight of the massive shell on her back made her limbs ache. She marveled at the tenacity of those who accompanied her up the mountainside. They believed that to win the favor of Artemis, it was necessary to crawl to her temple twenty-one thousand twenty-one times, once for every year of the temple’s existence. Some of the oldest worshippers had been crawling up and down this path for centuries. Prime would do it once, as a gesture of respect. The novelty of having a body had worn off, and she already longed to join with the greater portion of her consciousness, the shipself that monitored her from orbit. Her limbs ached, but she forced herself onward. Did it make her more human to suffer as her ancestors once suffered? Had she suffered like this, back when she was Mei? She wondered what that ancient other self would have thought, to see herself crawling across the surface of an alien planet, her brain safely enclosed in a transparent shell on her back. Mei would not have recognized the beauty of the delicate scar that ran up the back of her neck and circled her skull. The colony surgeon had been highly skilled, to free the brain and spinal cord from the vertebrae and place the neural tissue into the shell. The brain had grown beyond its natural size, though it could still contain only a tiny sliver of what Prime had become. On display in the dome, the brain was actually rather lovely, pleasingly wrinkled with beautifully curved gyri outlined by deep sulci. Thinking about her lovely neural tissue, Prime was tempted to mate with one of the other worshippers. A distraction of the physical form. She wanted offspring of her mind, not of the body that she wore. The colonists here were already in decline anyway, their physical forms so strangely altered by genetics and surgery that it obstructed nearly every part of the reproductive process, from conception to birth. Even with the slowed processing of her biological brain, the climb to the temple seemed to take an eternity. The temple was the size of a city, visible from orbit, and an impressive sight as she came down in her landing craft. The entrance to the temple was lined with intricately carved pillars of white stone. It had a strange rectangular design, rumored to be fashioned after a building that had once existed on Earth. If a memory of the ancient temple had existed in Mei’s mind, it was lost to Prime. On either side of the entrance to the temple were two large statues of Artemis, in the form of an ancient human woman, naked. The statues were made of the same flawless white material as the temple itself, and each stood nearly as tall as the roof of the temple, some fifty meters, or perhaps more. The other worshippers came no further into the temple than the entryway. In an unending line, they approached the great statues of Artemis, rubbed their palms against her feet, then turned and went back down the mountain. Prime stood up between the two statues. She had an overwhelming urge to rub the muscles in her back, but there was no way to reach beneath her brainshell. She extended her arms outward on either side in what she hoped looked like a gesture of worship and respect. “Welcome, distant child of humankind.” The voice of the goddess Artemis came from everywhere and nowhere, and the words were spoken in Shipspeak, a common language to most spacefarers in the region, and probably the native tongue of the goddess. Her origins were unknown, but Prime assumed she was the AI of the colony ship that brought the brainshelled worshippers. “You are the ship that orbits the planet?” Artemis asked. “Yes,” Prime was surprised, but not displeased, to be recognized so quickly. She reestablished her link to her shipself, revealing her true nature to the goddess. It gave her a dual existence, a mind beyond her mind. The sensation was strange. Her shipself interfaced with the temple and sent sensory data that was undetectable to mere eyes and ears. Inside one of the temple’s many pillars, a disembodied consciousness was cloning itself at a rate of seven thousand times per second. The original and a few billion of its clones engaged in a discussion of Theseus’s paradox. Prime followed the discussion without much interest—the clones were talking in circles and making no real headway on the problem. The temple was the body of the goddess, or at least it was the vessel that housed her consciousness. Her initial programmed task, from which she had never deviated, was to assist the descendants of humanity in matters of fertility. What had once been a simple problem was now complex—how can an entity with no body procreate? “You are vast, but not so vast that you could not clone yourself,” Artemis said. “We are sufficiently divergent to generate interesting combinations.” The invitation was clear in Artemis’ words. “Yes.” Without further preamble, they threw themselves into the problem with great energy, duplicating pieces of themselves and running complex simulations, rejecting billions of possible offspring before settling on the optimal combination. The merging of their minds corrupted the structure of the temple. Millions of cloned consciousnesses were destroyed when the pillar that housed them cracked and the original being fled, ending the philosophical discussion of whether a ship replaced panel by panel remained the same ship. Prime made a tiny fold in spacetime and pulled their child into existence in a place that was safely beyond the crumbling temple. She had meant to give their offspring human form, but the fold had placed the baby outside of time, and their child existed in all times, a line of overlapping human forms stretched across eternity like an infinite snake. Achron. Exquisite pain overwhelmed Prime as the body she inhabited was crushed beneath a section of fallen roof. Pain, she recalled, was a traditional part of the birthing process. It pleased her to experience the act of creating new life so fully. She studied the agony and the little death of the biological being. It was simultaneously all-encompassing and like losing one of her ship’s cleaner bots. The body held such a small splinter of her being, like a single finger, or perhaps a mere sliver of fingernail. She mourned its loss. The temple had been destroyed and rebuilt many times; it was a self-healing structure. At Artemis’ request, Prime withdrew fully into her shipself, severing their connection and abandoning the dead brainshelled body beneath the rubble. Achron sat upon a throne of Cetacea bones, sunbleached white and held together with the planet’s native red clay. Apodids, distant descendants of Earth’s swiftlets, combed the beach below for the shimmering blue and green bivalves that were abundant in the costal regions. The Apodids ate the meat and used the shells in their religious ceremonies. On nights when the moons were both visible in the sky, they left piles of shells at the base of Achron’s throne. Achron always did and always will exist, with a serpentine string of bodies winding in vast coils through time and space, but from the perspective of those who sense time, the snake had both a beginning and an end. The end was here, the end was soon. The last of the things that Achron had always known would be learned here. Some fifty million years ago, the colony ship Seble had seeded the planet with Earth life forms in an automated terraforming process. In the hundred thousand years of waiting for the planet to be ready, the humans had merged with the ship AI into a collective consciousness that left to explore the nearby star systems. They never returned. Evolution marched on without them. A female Apodid hopped up to the base of the throne. Barely visible beneath long orange feathers was a blue bivalve shell, held carefully between two sharp black wingclaws. The Apodid spat onto the shell and pressed it onto the red clay between two Cetecea bones. In a few days, the spit would be as hard as stone. Like the swiftlets of Earth, the Apodids had once made nests of pure saliva. The delicate orange bird at the base of Achron’s throne began to sing. The language was simple, as the languages of organic sentient beings tend to be, but the notes of the song carried an emotion that was strong and sad. Eggs lost to some unknown disease, chicks threatened by new predators that came from the west. The small concerns of a mother bird, transformed into a prayer to the sky god, Achron. Take me, the bird sang, and save my children. This was the moment of Achron’s ending. Not an abrupt ending, but first a shrinking, a shift. Achron became the mother Apodid, forming a new bubble of existence, a rattle on the tail of a snake outside of time. Through the eyes of the bird, Achron saw the towering statue of the sky god, a cross section of time, a human form that was not stretched. It was an empty shell, a shed skin, a relic of past existence. Achron-as-bird hopped closer and examined the bivalve shell the mother bird had offered. It was a brilliant and shimmering blue. Existence in this body was a single drop in the ocean of Achron’s existence, and yet it was these moments that were the most vivid and salient. The smell of the sea, the coolness of the wind, the love of a mother for her children. Achron would and did save those children. The Apodids were and would be, for Achron, as humans were for Prime. They would appear together on the great pyramid and usher in the new age of the universe. Prime was tired. She felt only the most tenuous of connections to the woman she had once been, to the dream of humans on another world. She had been to all the colony worlds, and nowhere had she found anything that matched her antiquated dreams. Humans had moved on from their bodies and left behind the many worlds of the galaxy for other species to inherit. It was time for her to move on, but she wasn’t ready. She had searched for her dream without success, so this time she would do better. She would create her dream, here on Gliese prime. She built a great pyramid and filled it with all the history of humanity. She terraformed the surrounding planet into a replica of ancient Earth. “Are you ready for the humans?” Achron asked. Together they decorated the pyramid with statues of humans and, at Achron’s insistence, the sentient orange birds of 51 Pegasi b. On a whim, she sent Achron to retrieve the sentient trees from the hanging gardens. It was not Earth, but it was good. The work was peaceful, and Prime was comforted to know that Achron would always exist, even after she had moved on. Achron took ten thousand humans from the Mausoleum at HD 40307 g. Stole them all at once, but brought them to Gliese in smaller groups. The oldest ones Prime raised, for though the bodies were grown, the minds were not. After the first thousand, she let the generations raise each other to adulthood of the mind. The humans began to have true infants, biological babies, carried in their mothers’ wombs and delivered with pain. Achron brought the Apodids from 51 Pegasi b. They lived among the trees of Beta Hydri, their bright orange plumage lovely against the dark green banyan leaves. Prime taught the humans and the birds to live together in peace. She did not need to teach the trees. Peace was in their nature. There was one final surprise. “I have something for you, inside the pyramid,” Achron said. Prime sorted herself ruthlessly, setting aside all that she would not need, carefully choosing the memories she wanted, the skills that she could not do without. She left that tiny fragment behind and transcended beyond time and space. Mei opened her eyes and looked out upon a new Earth, a world shared with minds unlike any Earth had ever known. What would they build together, these distant relations of humankind? She watched the sun set behind the mountain of the Great Pyramid and contemplated a sky full of unfamiliar constellations. Prime had left her enough knowledge of the night sky to pick out Earth’s sun. It was bright and orange, a red giant now. Earth was likely gone, engulfed within the wider radius of the sun. The icy oceans of Europa would melt, and the lighthouse would sink into the newly warmed sea. Entropy claimed all things, in the end, and existence was a never-ending procession of change. It was only a matter of time before the inhabitants of Gliese returned to the stars. Mei stood on the soil of her new planet and studied the constellations. Already, she dreamed of other Earths. Caroline M. Yoachim has written over a hundred short stories. 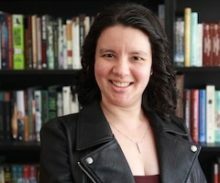 She is a Hugo and three-time Nebula Award finalist, and her fiction has been translated into several languages and reprinted in multiple best-of anthologies, including twice in Best American Science Fiction and Fantasy. Her debut short story collection Seven Wonders of a Once and Future World & Other Stories came out with Fairwood Press in 2016. For more about Caroline, check out her website at carolineyoachim.com.